It came out of the northwest, a brilliantly glowing white “star”, moving faster than any airplane. It climbed higher and higher in the night sky, progressively brighter as it approached. Slowly at first, then appearing to gain speed as it drew near, it passed almost directly overhead. I was standing in my driveway, trying to squint past the brilliant floodlights of the church parking lot across the street, and focus the sight in my binoculars (that I purchased at Johnson Space Center, Houston, at a “garage sale” they had in the commissary the day of my visit!) . Not powerful enough to resolve the station from a bright point of light into the actual structure, I put them down to enjoy the site through the best oculars available to me tonight, my own eyes. 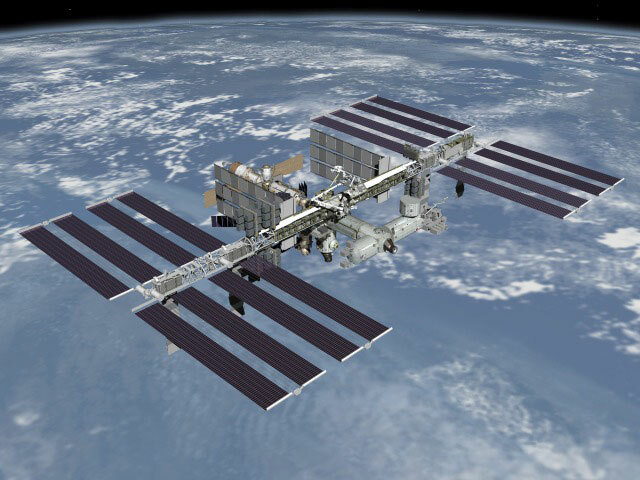 Moving from the northwest towards the southeast, the International Space Station is a wonder of engineering and construction. Currently occupied by six Expedition 24 crew members, the Station sped past at orbital velocity of close to 17,500 mph. It was thrilling, and a bit strange, to stand in my driveway, looking up, and thinking about those six astronauts and cosmonauts living inside that bright light, and wondering what they were doing right then. Was anyone looking out the cupola, down at Earth? I’m looking up at them, and so are many others, some of them on Twitter, including Wil Wheaton, (actor, writer, Wesley Crusher from Star Trek Next Generation), wondering what it would be like to be there, floating in space, and making history every second. What I wouldn’t give to be up there! The station passed almost directly overhead, and started fading from sight almost immediately. You could watch as it entered the shadow of the Earth, fading quickly from a bright white, to a muted orange, a moment or two of red, then quickly it was gone, fully shadowed from the Sun by the Earth. The view from my driveway started at 9:45 pm. It was over by 9:48. The station passed over Visalia Monday night. I found the viewing times for Visalia here, at NASA’s Human Space Flight page. They’ll pass overhead again tomorrow and Wednesday, but I’ll be at work and will miss those opportunities. The only times you can see the station pass overhead are just after sunset, and just before sunrise, as you are in darkness, but the orbital slot of the station is still in sunlight. I just passed my 16th anniversary with the Sheriff’s Department. Since I’ve been a 9-1-1 dispatcher, I really can’t think of any other job I’d rather do, and I can’t see myself doing anything else. There’s only one thing I’d rather do… can you guess? Yeah, I’d be an astronaut, in a heartbeat. Maybe in one of those alternate universes science fiction is so fond of… but in this one all I get to do is watch and wonder.